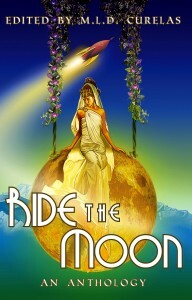 Ride the Moon, the new anthology by Alberta’s new micro publisher, Tyche Books, is now available and feature stories by several SFCanada members. SFC members with stories in the anthology include: Krista D. Ball, “On the Labrador Shore, She Waits”; Ada Hoffmann, “Moon Laws, Dream Laws”; Rebecca M. Senese, “Moon Dream”; Shereen Vedam “Aloha Moon”; and Edward Willett, “Je Me Souviens”. “For thousands of years, the Moon has inspired stories and legends about heroic animals, violent deities, and criminal humans. In modern times, those tales have been overshadowed by vampires and werewolves. It’s time for the Moon and her denizens to take back the night.